Home / Gadgets / LG LOOKS TO REDEFINE ENERGY EFFICIENCY WITH THE NEW "LG ART COOL PREMIER"
LG LOOKS TO REDEFINE ENERGY EFFICIENCY WITH THE NEW "LG ART COOL PREMIER"
Over the last decade, the global population has become increasingly aware of the impact of global warming on everyday life. The conversation has largely been driven by climate change with changing weather patterns adversely affecting livelihoods from drought in Sub-Saharan Africa to industrial smog in China. The evolution of the smart home concept is increasingly enabling consumers to take control of and manage the use of energy within their home. One can customize appliances to utilize less energy regardless of the sources exploited. To this end, manufacturers of home appliances have a role to play. Appliances should increasingly become eco-friendlier in the utilization of energy providing a more user-centered solution to the management of energy. The smart home concept that features central control modules and consoles for home appliances can then be utilized to give the consumer-intuitive control of the appliance. LG’s Art Cool Premier is an energy efficient appliance that ramps up or down to match the load of each room’s demand. When a selected temperature is reached, the appliance operates at a low speed to maintain comfort levels instead of continuing to turn on and off, and as a result uses less power. The appliance is among a variety of air conditioners that runs on the Variable Refrigerant Flow (VRF) technology. 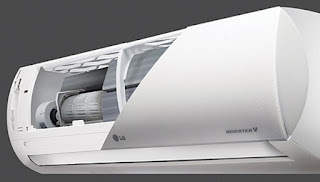 “LG is dedicated to creating sustainable technologies, developed with the environment in mind. We recognize the growing demand for air conditioning across the globe as more industries and individuals seek to meet their heating and cooling needs.” Mr. McNamara said. “Our appliances in this category run on VRF technology, we at LG are proud to lead the way in sustainable buildings and aim to raise the bar in efficiency year after year.” He added. Global sales in air conditioning systems are set to hit 137.8 million units by 2020. This is according to the Global Industry Analysts, Inc. (GIA). As at 2015, Air conditioning systems in residential, commercial and industrial sectors worldwide consumed over 1 trillion kilowatt-hours of energy running on mostly run down and poorly maintained systems. If a quarter of this systems were to be well maintained or replaced with more efficient systems, the resultant saving would be enough to run an entire city. Energy efficiency could hold the key to bringing down the amount of energy consumed, to chart the path towards an eco-friendlier future, manufacturers and consumers may have to change the world one appliance at a time.